The primary role of vitamin D is the maintenance of healthy bones and teeth, however the health of the immune, brain, cardiovascular, respiratory, nervous, and muscular systems also depend on the support of vitamin D. As an aid to diabetes management, vitamin D helps to regulate insulin levels. It also influences genetic expression in cancer development, and may have protective effects against depression, insomnia, and other diseases or conditions. Studies show that up to 50% of adults and children worldwide may be deficient in vitamin D.
Causes of deficiency can include inadequate sun exposure, sunscreen use, seasonal sunlight shortages, skin tone, obesity, malabsorption, aging, decreased outdoor activity, certain pharmaceuticals, and residential location. Vitamin D insufficiency can lead to a loss of bone density, increased risk of bone fractures and osteoporosis. Deficiency is tentatively linked to metabolic disease, hypertension, upper respiratory tract infections, and increased cardiac events. Research suggests that It can take as little as 10 – 30 minutes of twice weekly unprotected midday sun exposure for the body to synthesize vitamin D3. This begins with skin exposure to solar ultraviolet B (UVB) radiation, which allows provitamin D found in the skin to be converted into pre-vitamin D3. Gradually, after further conversion in the liver and the kidneys, a useable form of vitamin D3 circulates in the blood stream. Yet the sun’s rays are a major risk factor for nonmelanoma and malignant melanoma skin cancers, and cumulative solar UV rays result in photoaging of the skin. Not everyone agrees that complete avoidance of sun exposure benefits overall health, as this results in low levels of this important nutrient. There are limited dietary sources of vitamin D, such as fatty fish, liver, and cod liver oil, as well as fortified foods. However, most dermatologists agree that the regular use of sunscreen is the best way to protect against the harms of unprotected sun exposure. -Vitamin D is essential for calcium absorption and regulation and the maintenance of blood levels of phosphorus, both extremely important for maintaining healthy bones. -Inadequate levels of vitamin D can lead to muscle weakness and loss of optimal muscle function. Research shows that supplementation can be effective in preventing falls in adults over 65 years of age. -Vitamin D is important for regulating cell growth and for cellular communication. Studies suggest that vitamin D may reduce cancer progression by slowing the development and growth of new blood vessels in cancerous tissues, increasing cancer cell death, and reducing cell proliferation. 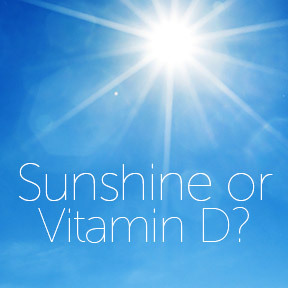 -Vitamin D facilitates normal immune function and improves resistance against certain diseases. Mounting evidence links low levels of vitamin D to an increased risk of diabetes, heart disease, dementia, depression, increased blood pressure, muscle weakness, bone pain and breast, colon, prostate, ovarian and other cancers. If you have concerns about sensible sun exposure or have a history of skin cancer, supplementation is the safest, most effective way to get the vital amounts of vitamin D your body needs for good health. Supplementation guidelines vary. In general, a therapeutic range for children one year and older is 600 – 1,000 IUs daily and adults 1,500 – 2,000 IUs. Your healthcare provider can recommend optimal amounts for you based upon your own personal health status, or your 25-hydroxy vitamin D blood test levels. Consider taking vitamin K2 along with vitamin D3, as these two nutrients work synergistically to strengthen your bones and improve your health. Because all chronic conditions are multifactorial, it’s important to obtain adequate levels of all nutrients to support optimal heath and function, and reduce the risk of developing chronic health conditions. If you are pregnant, nursing or taking blood thinning medications, please consult your healthcare provider before supplementing with vitamins D3 and K2. Single Tests in Blood Spot Vitamin D 25-OH, Total by ZRT Laboratory: This spot blood test provides a simple, convenient and accurate way to measure levels of vitamins D2 and D3. The kit includes all necessary tools for collecting the blood sample, as well as a pre-paid U.S. shipping label to send the sample off to the lab for analysis. The kit includes a 15 minute in person or phone consult with our Registered Nurse to review your results. Bio-D-Mulsion Forte® by Biotics Research: One drop supplies 2000 IU of highly absorbable vitamin D3 in micro-emulsified form designed to be helpful for those with malabsorption issues. Gluten free. Vitamin D3 1000 IU by Pure Encapsulations: One capsule provides 1000 IU of vitamin D3 in support of bone health and calcium absorption. Gluten and soy free, Non-GMO vegetarian formulation. D3 2000™ by NuMedica: One daily softgel provides 2000 IU of natural bioidentical vitamin D3 as highly absorbable cholecalciferol. Gluten, wheat, soy, yeast, dairy and artificial ingredient free. Vitamin D 5000 IU by Douglas Laboratories: One tablet supplies 5000 IU of vitamin D3 in support of calcium absorption, bone metabolism, neuromuscular and immune health and a healthy inflammatory response. Gluten, wheat, soy, yeast, dairy and artificial ingredient free. Liquid Vitamin D3 2000 IU by Protocol for Life Balance: One serving provides 2000 IU of natural vitamin D3 preserved with medium chain triglycerides. Gluten, wheat, and soy free. Very Emollient Sunscreen Pure Lavender SPF 45 by Alba Botanica®: This lightly scented, fast- absorbing sun lotion provides broad spectrum UVA/UVB protection. Water resistant, paraben, phthalate, and oxybenzone free, vegetarian formulation. Cool Sport™ Face & Neck SPF 30 Sunscreen by Kiss My Face: This fragrance free, water resistant broad spectrum sun lotion offers Antioxidant Defenders® to protect and freshen skin. Gluten, paraben, phthalate, and artificial ingredient free. Vegan friendly. This entry was posted in Home and tagged Bio-D-Mulsion Forte by Biotics Research, Cool Sport™ Face & Neck SPF 30 Sunscreen by Kiss My Face, D3 2000™ by NuMedica, Liquid Vitamin D3 2000 IU by Protocol for Life Balance, Single Tests in Blood Spot Vitamin D 25-OH, Sunscreen and Vitamin D, Sunshine, Total by ZRT Laboratory, Very Emollient Sunscreen Pure Lavender SPF 45 by Alba Botanica, Vitamin D, Vitamin D 5000 IU by Douglas Laboratories, Vitamin D3 1000 IU by Pure Encapsulations. Bookmark the permalink.